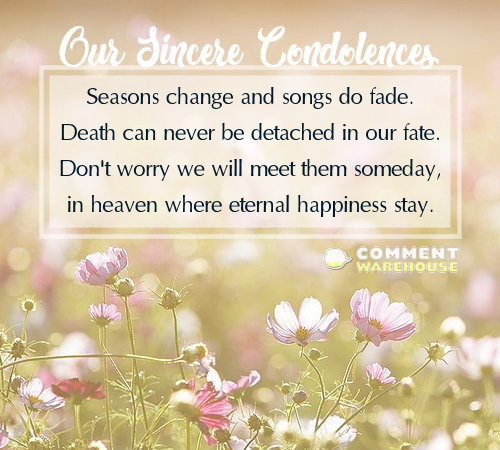 Condolence Messages and Words of Sympathy – Commentwarehouse | Say it with a pic! 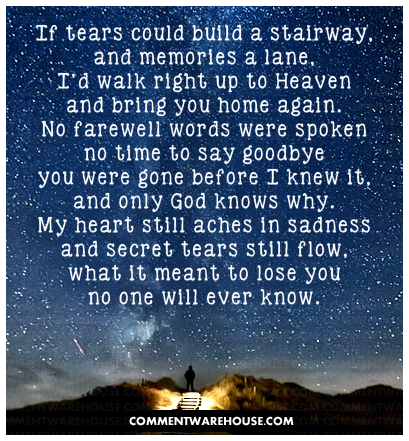 Grief and loss are difficult for everyone. Finding the right words to provide comfort to a family member, friend, or co-worker isn’t an easy or simple task. 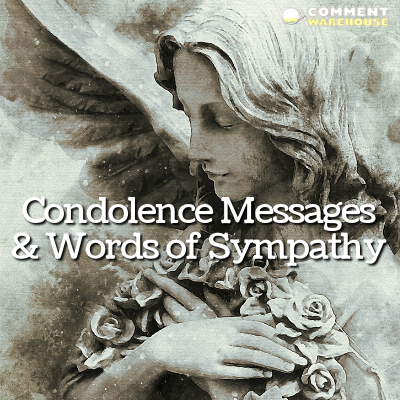 Here is a list of condolence messages and words of sympathy that can help you decide on the words to best convey your feelings and support in a greeting card, floral card, email or online message. My heart is saddened to hear such a loss of someone so dear. My deepest condolences. Be strong, we are here for you. You will never be alone. My deepest condolences. My God grant you perfect peace that drives away all sorrows and fears. And in the days to come, we will surely meet him again where death can no longer tear us apart. My deepest sympathy for your loss. Be strong and believe that there’s still a brighter tomorrow for you, just as envisioned by your mom. Go and fulfill that vision she had for you and make her proud as she looks down from heaven. My heart weeps in agony when i heard such a great loss. Truly his memories will be carved deep in our hearts. We express our heartfelt sympathies to your and your family. We can only pray to God that he will stay by your side. Our deepest sympathies. My heartfelt condolence to you for the loss of your father. I hope you will be fine when days pass by. I know no one can replace your father’s place. Try to grow courage in yourself. Be strong and always draw strength from the Lord. Praying that God grants peace to the soul of your dearly departed. My deepest condolences. We very well know it is difficult to bear this loss. Please try to take things easy as days go by. Our deepest sympathies are with you and your family. There’s always a time to live and be free, a time to die and embrace eternity, a time to cherish one’s memories, and a time to meet them someday. Be strong. There’s a brighter tomorrow ahead. Condolences. 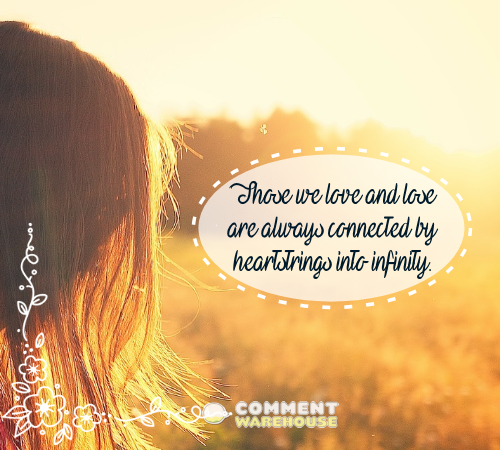 May your heart find peace and comfort in these trying times. Our thoughts and prayers are with you always.